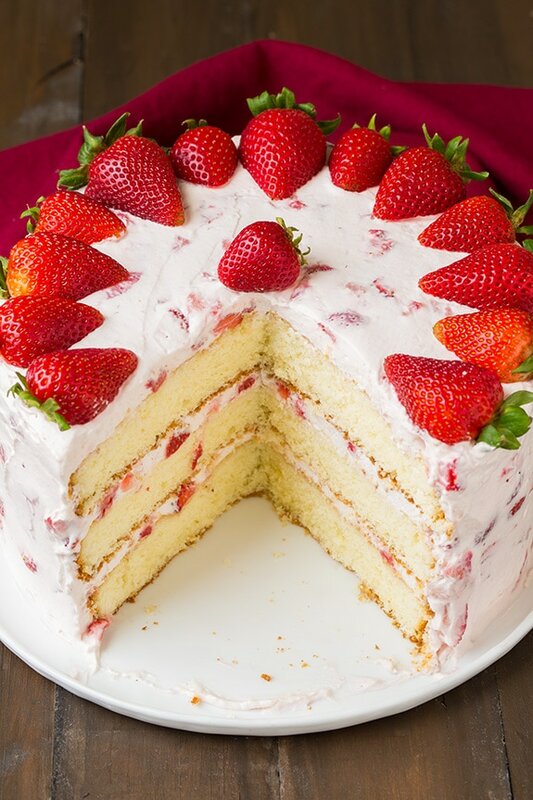 The only Strawberry Cake recipe you’ll ever need! 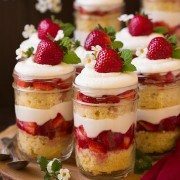 A fluffy vanilla cake is loaded with fresh sweet strawberries and a rich cream cheese whipped cream. 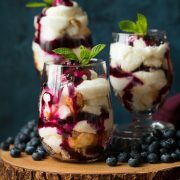 The perfect summer recipe for any celebration or get together. This was the cake I wanted for Mother’s Day…so I made it for myself 5 days early. I’m always looking for a reason to make cake, can you tell? 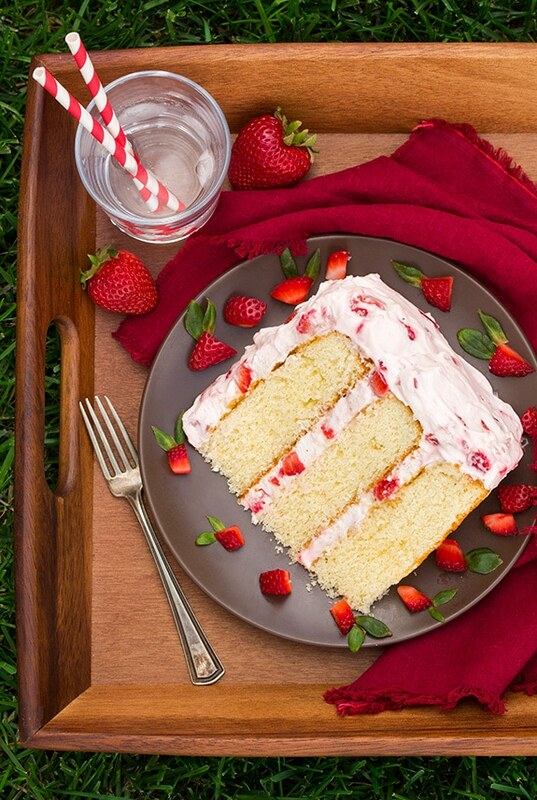 This fresh strawberry cake is perfect for any holiday, but it’s also perfect just to celebrate any summer day. Do you know anyone who doesn’t love the fresh strawberries and cream combination? So when you combine them together along with some tangy cream cheese and add it to the top of a sweet vanilla cake, you know it’s got to be good, and oh how it is! I had to hurry and take giant slices to my neighbors or I would have just dove into the whole cake and never known when to stop. It is creamy, dreamy, fluffy heavenly cake and I most definitely loved it! Happy Mothers day to me! But really, Happy Mothers Day to all you Moms out there! Sift cake flour and whisk dry ingredients. Mix in eggs and yolks separately then blend in vanilla. Blend in flour mixture alternating with additions of milk. Divide among cake pans and bake until set. Let cool then fresh with strawberry cream cheese whipped cream. 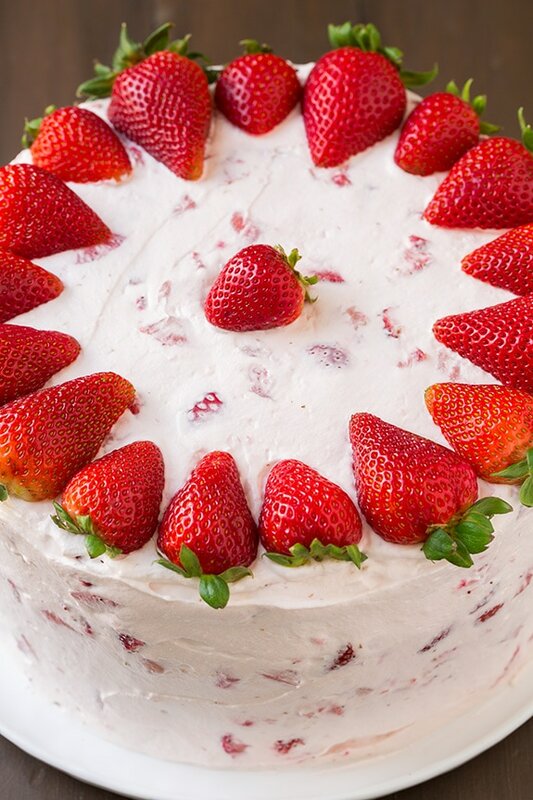 Cake flour really is best for this strawberry cake recipe with fresh strawberries. It makes the vanilla cake lighter and creates the best texture. For the best flavor, fresh strawberries are best. I don’t think defrosted frozen strawberries would work here. Wait until the vanilla cake layers have cooled completely before adding the frosting. 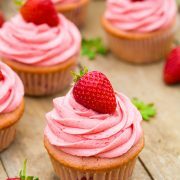 Feel free to add a few drops of red food coloring to the frosting to make it a lovely pink color. If you only have salted butter on hand, scale back on the amount of salt you add into the cake batter. 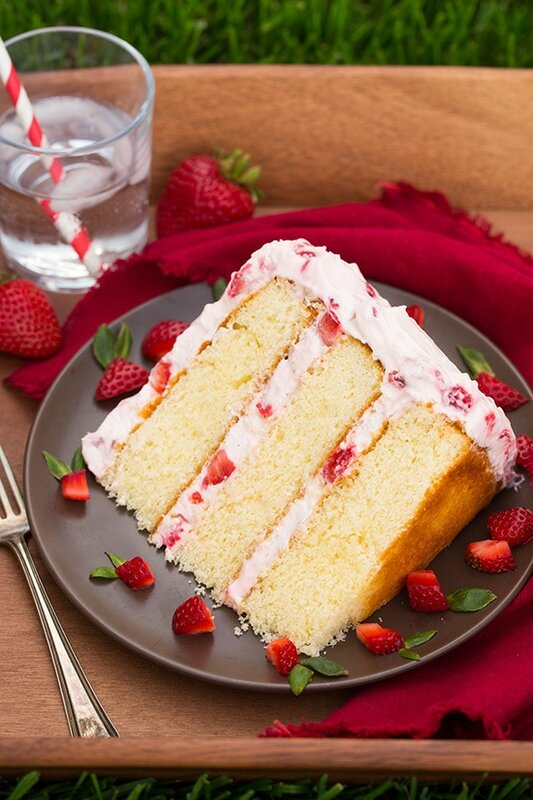 The only Fresh Strawberry Cake recipe you'll ever need! 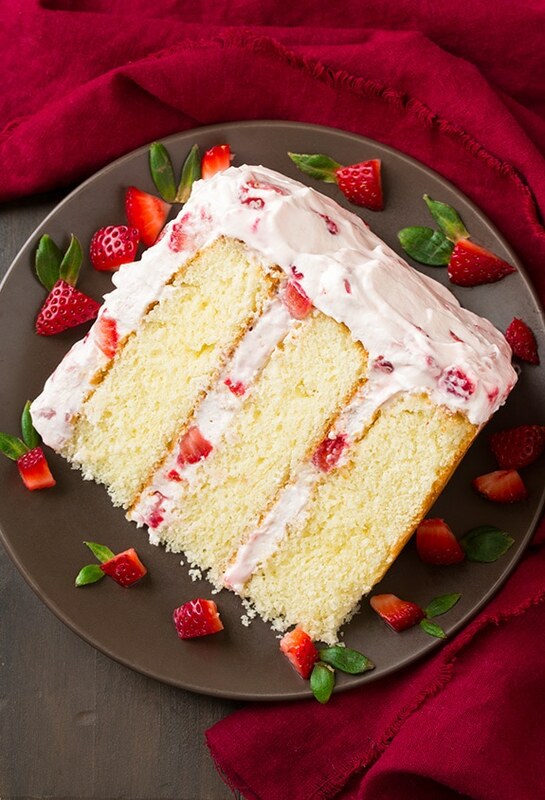 A fluffy vanilla cake is loaded with fresh sweet strawberries and a rich cream cheese whipped cream. Preheat oven to 350 degrees. Butter 3 9-inch round cake pans then line bottom with a round of parchment, butter parchment and lightly dust pan with flour, shake out excess. Set pans aside. Make the cake: Sift cake flour into a medium mixing bowl. Add baking powder and salt and whisk 20 seconds, set aside. In the bowl of an electric stand mixer fitted with the paddle attachment (if you don't have a paddle that constantly scrapes bowl while mixing then stop mixer occasionally throughout entire mixing process and scrape down sides and bottom of bowl to ensure even mixing), whip together butter and sugar until pale and fluffy. Mix in eggs and egg yolks one a time adding in vanilla with last egg yolk. Add 1/3 of the flour mixture at a time (to the butter/egg mixture) alternating with 1/2 of the milk and mixing on low speed just until combined after each addition. Scrape down sides and bottom of bowl and gently fold batter several times. Divide batter among prepared baking pans. Bake in preheated oven 25 - 30 minutes until toothpick inserted into center of cake comes out clean. Cool in pan about 5 minutes, run knife around edges of cake to ensure they are loosened then invert onto wire racks to cool completely (I recommend transferring them to gallon size resealable bags after about 25 minutes of cooling so they don't dry and let them finish cooling in the bag). Once cool frost with Strawberry Cream Cheese Whipped Cream. Store cake in an airtight container in refrigerator. For the topping: In the bowl of an electric stand mixer fitted with the whisk attachment, whip heavy cream until soft peaks form (occasionally scrap down sides and bottom of bowl to ensure even mixing). Add 1/3 cup powdered sugar and whip until stiff peaks form (make sure they are stiff or your topping will be runny, it should get to the point where it doesn't have a wet sheen). Scrape cream out into a separate bowl. Add cream cheese to bowl of stand mixer, fit with paddle attachment and whip cream cheese until smooth and fluffy. Mix in remaining 2/3 cup powdered sugar and vanilla (I've made this cake twice and the second time I added a few drops of liquid red food coloring at this point for a better pink, that pictured was without). Add strawberries and mix until uniform in color. Remove bowl from stand mixer, add whipped cream and fold into mixture. Frost over cooled cake. Drew: Made this a couple days ago and my girlfriend and I have already eaten over half the cake. By far, one of the best cakes I’ve ever made. (Little bit of bias there though, since it is my favorite kind of cake). Only issue I had was my cake layers falling a bit after coming out of the oven. Aside from that, it was pretty much perfect.